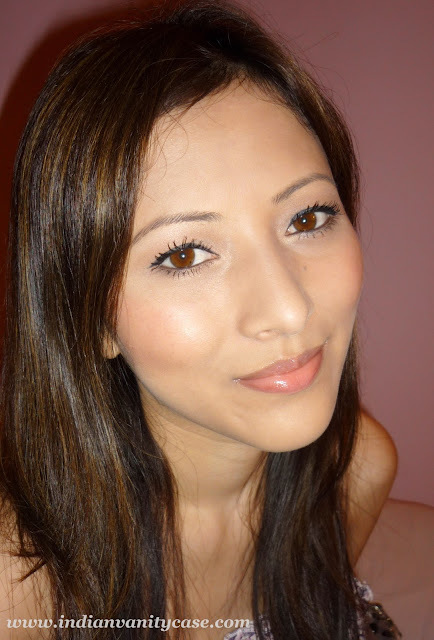 I've been using nothing but Lakme Cheek Artist Peach Blush for the past 1 week, and the verdict is in. ♥ It's very hard to overdo with this, because the more you blend it, the more it'll disappear in your skin. ♥ Blends effortlessly. It doesn't become blotchy at all. ♥ Stays put throughout the day, as long as it's not too hot. 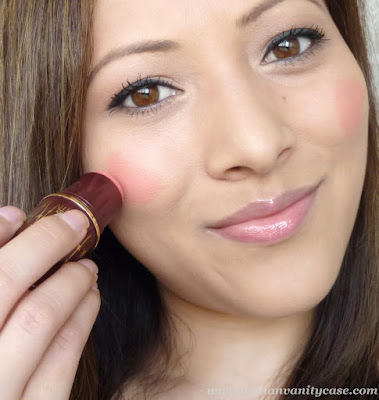 ♥ Although it's a cream blush, it doesn't feel greasy or sticky. It dries to a matte finish. ♥ Portable and fuss-free. No need for a brush. - Packaging is kinda unstable. The upper cylindrical tube that holds the blush came out of the base from the first time I tried to pull the cap. 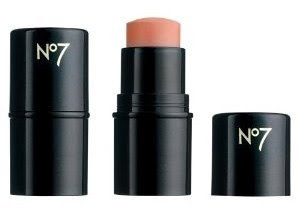 - Can't apply it on temples and chin (and nose) coz of the shimmer. Then you'll look too disco. - You need to layer it for the color to show. You'll only see the shimmer with just one swipe. How to Apply: Smile and apply right on the apples of your cheeks (make round spots) and blend towards your hairline & downwards with fingers. Try not to go inwards towards your nose. That's where the large pores are, and because this has shimmer, it will emphasize them. Place 2 fingers (index and middle) between the sides of your nose and apples of your cheeks as a guide. Daylight washed out the color out too much (on camera) so I had to take pictures in different lighting to show the true color of the blush. 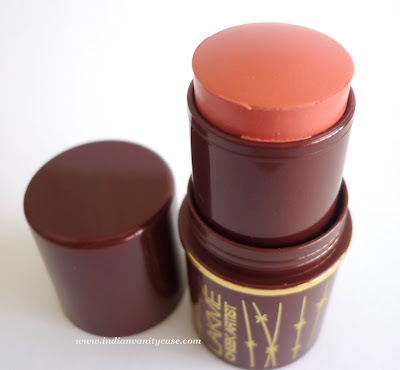 All-in-all, I think this is a pretty good cream blush and hope Lakme comes up with more shades (and maybe prettier packaging....sigh.) 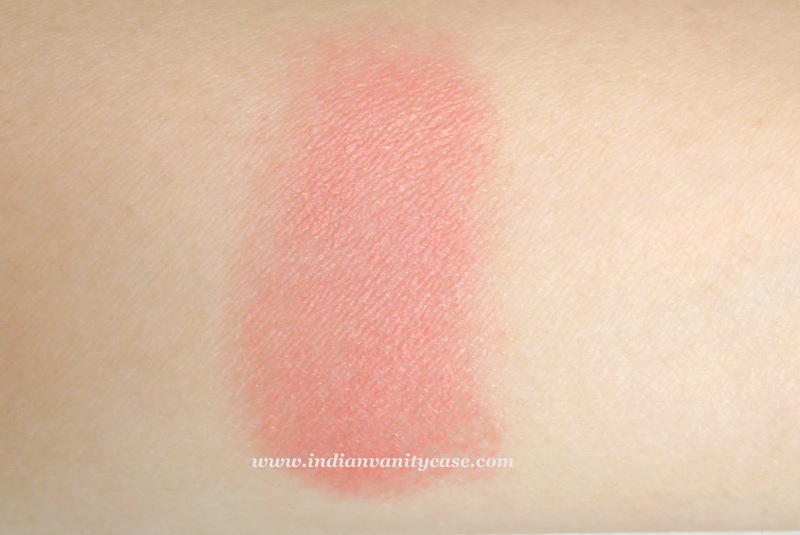 It's available in just one more shade- Kiss of a Rose, a dusty rose shade in matte finish, which I'm getting next. CZ ur complexion it glows...how? and the final look is beautiful too! thank you sooooooooooo much for reviewing!!!!!!!!! 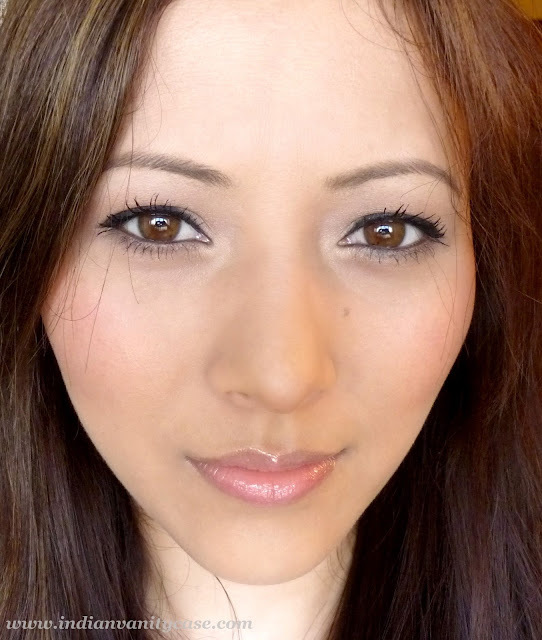 I've been using the shiseido accentuating color stick in peach for years and its fab and just like this! But four times the cost!!! Wow..I must say, you look absolutely polished fine! I mean, your skin is so healthy and the complexion is good. Nice site,gal! loved reading it.